18 years ago tomorrow, September 1, 2018, the legendary, iconic, and original Nokia 3310 feature phone was launched into the world. Fast forward to last year, HMD Global, the new home of Nokia devices, launched the 2017 version of that phone with a few updates and new-yet-familiar looks. And to celebrate this date, HMD Global is going to offer special discounts on the Nokia 3310 2017 feature phone for the whole month of September. From its original price of Php2,490, it will be offered for just Php1,999 for the next 30 days across the Philippines. "This is an exciting time for us. The Nokia 3310 is especially memorable to Filipino Nokia fans for being among the first phones that they got to experience. It brought Filipinos a lot of fun memories, from composing personal ringtones to achieving high scores in Snake and Space Impact. The phone's long battery life made extended hours of entertainment and staying in touch with family and friends possible. 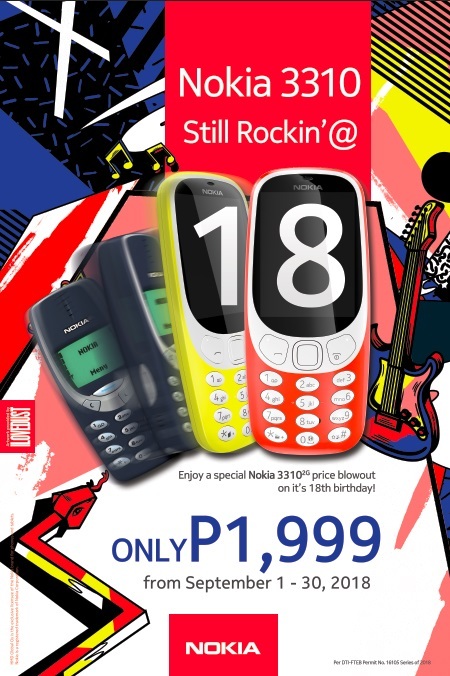 More than a mobile experience, the Nokia 3310 became an essential mean to connect people," shared Shannon Mead, Country Manager of HMD Global Philippines. "This is why at HMD Global, we are committed to creating new fun memories through the new generation of Nokia phones, which features upgraded designs and improved performance while retaining the same reliability and durability made accessible across all markets." he concluded. The Nokia 3310 2017 is still available in four colors. The ever popular Yellow and Warm Red, and refreshingly new Azure and Charcoal hues, all with a matte finish and new silver keypads. Below is the list of stores where you can buy the 2G-powered Nokia 3310 2017 from.